Breast lift surgery, also known as mastopexy, is commonly requested in our Raleigh, North Carolina plastic surgery practice. Pregnancy, breast feeding, weight loss and aging are just a few of the factors that cause breasts to lose their shape and position. To reclaim an uplifted appearance, an increasing number of women are choosing to have a breast lift procedure or a breast lift with implants. 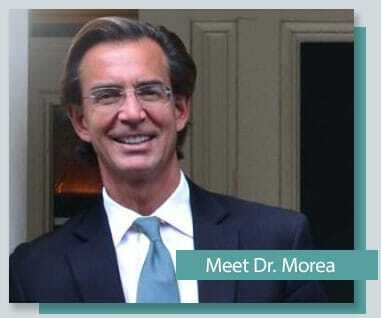 Dr. Morea and his staff at Morea Plastic Surgery Center of North Raleigh have brought their skill and artistry to breast surgery and have helped thousands of women achieve the look they desire. A breast lift raises and reshapes sagging breasts by removing excess skin and tightening the surrounding tissue to reshape and support the new breast contour. The areola may become enlarged over time and a breast lift surgery will reduce this as well. A breast lift rejuvenates the female figure with a breast profile that is more youthful, uplifted and firm. When an increase in breast volume is also desired, breast implants may be inserted in conjunction with a breast lift. The breast implants may be saline filled or silicone filled breast implants. Dr. Morea will help you determine which implant would work best for you. Breast lift surgery in Raleigh, North Carolina is an appropriate procedure for women who wish to improve breast shape, size and position. At Morea Plastic Surgery, breast lift and breast lift with implants is an outpatient procedure which is performed in our fully accredited in-house surgical suite. A breast lift is a three-hour procedure that is performed under general anesthesia. It requires an anchor shaped incision pattern: one around the areola, a second from the areola to the crease under the breast and the third along the breast crease. Most patients return to daily activities, including driving, within three to five days after surgery. It is important, however, however not to lift more than five pounds for three to four weeks, after which time you should be back to full activity. Although it takes up to several months to see final results, you can start enjoying the look of your shapelier, uplifted breasts almost immediately. During your breast lift consultation, you meet personally with Dr. Morea and he will review many before and after photos of breast lifts that he has performed. You will have the opportunity to discuss your options with regard to size, shape, position and type of implants if you choose to increase the size of your breasts. Dr. Morea will help you determine which type of cosmetic breast lift procedure is best for you. He will give you a personal tour of his Raleigh, N.C. plastic surgery center. At the end of your plastic surgery consultation, you will be given a quote for the exact cost of the breast lift procedure designed for you.